The 1944 GI Bill enabled millions of soldiers returning from World War II to enroll in college or job-training programs. At the same time, however, many for-profit trade schools took advantage of the vouchers by recruiting veterans into what turned out to be low-quality programs. Frequently, school owners took the money without leaving enough to even finish the courses that students had enrolled in. Grappling with many of the same problems evident today, Congress—and the Truman and Eisenhower administrations—took decisive bipartisan steps to rein in predatory institutions to protect students and taxpayers. This report is part of a series of papers published by The Century Foundation focusing on the repeated for-profit college scandals of the past sixty years. Policymakers should learn from this history so that these abuses do not return again to victimize future generations. This report is the first in a TCF series—The Cycle of Scandal at For-Profit Colleges—examining the troubled history of for-profit higher education, from the problems that plagued the post-World War II GI Bill to the reform efforts undertaken by the George H. W. Bush administration. 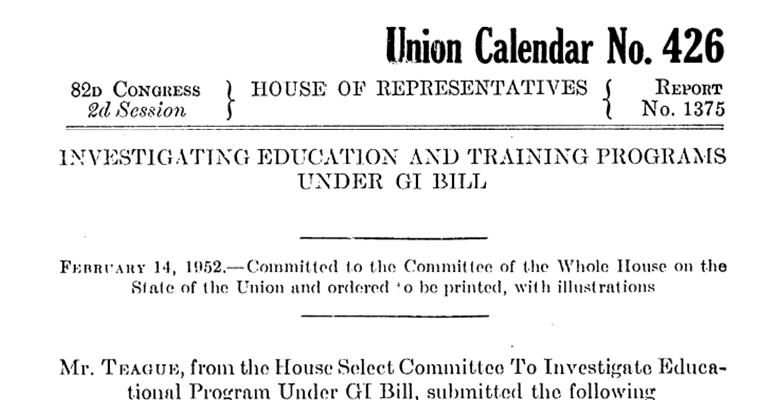 The 1944 GI Bill is rightly remembered as one of the most effective social policy programs in U.S. history. Thanks to the GI Bill, millions of soldiers returning from World War II had the opportunity to enroll in college or job-training programs, and had access low-interest loans to buy homes. What has been largely forgotten, however, is that the GI Bill also led to systematic abuses at for-profit schools—schools that sprang up to take advantage of what was essentially a government educational voucher with no strings attached. Congress and the Truman and Eisenhower administrations soon realized that strings were needed. A description of how one state approved schools for the GI Bill, from an article in Collier’s Weekly, May 1, 1948. Click here to view the full Teague Report. The issues that Congress grappled with in 1952 are, in many respects, the same struggles that today’s lawmakers are having: given the financial incentives that for-profit school owners have to enroll as many students as possible and to spend as little as possible on their education, how can government aid be designed so that it encourages enrollment of qualified students in quality career-training programs? A new strategy included in the 1952 legislation was to involve private accrediting agencies, which colleges themselves had created years before as a voluntary system of quality assurance through peer review. With the explosive growth of for-profit schools, the VA was overwhelmed and understaffed when it came to processing veterans’ educational benefits, as well as monitoring and enforcing regulations. States, likewise, had been similarly unprepared for the flood of schools and programs unleashed by the 1944 GI Bill.23 Deferring to accrediting agencies seemed like a convenient, low-cost solution that kept the government out of the business of directly setting quality standards. In 1949, 546,000 veterans made course changes, roughly twenty times as many veterans who made courses changes in 1946 (26,000). James Bowman et al., “Educational Assistance to Veterans: A Comparative Study of Three GI Bills,” Educational Testing Service, September 1973, reprinted in Final Report on Educational Assistance to Veterans: A Comparative Study of Three G.I. Bills, Committee on Veterans’ Affairs, U.S. Senate, Senate Committee Print No. 18, September 20, 1973, 93rd Cong., 1st sess., 171. By some accounts, at least 9,000 proprietary schools and as many as 13,000 proprietary schools participated, however briefly, in the training of veterans in the five years after the signing of the GI Bill. See the testimony of Harold Orlans, a researcher at the National Academy of Public Administration Foundation, in Proprietary Vocational Schools, Special Studies Subcommittee of the House Committee on Government Operations, 93rd Cong., 2nd Sess, July 1974, 56. The January 1950 Gray Report by Carl Gray, the VA Administrator, reported that there were more than 7,500 for-profit institutions on VA approval lists in 1949. Cited in A.J. Angulo, Diploma Mills (Baltimore, Md. : Johns Hopkins University Press, 2016), 64. While 2.2 million vets went to four-year colleges on the GI Bill, more than three million GIs used their educational benefits to enroll in trade and technical and business schools (2.4 million vets), with another 637,000 veterans taking correspondence courses. Teague Report, 92. Bowman et. al, Final Report on Educational Assistance to Veterans, 114. Rowland Evans Jr., “VA Would Check Some GI Schools,” Washington Post, August 21, 1949. A. J. Angulo, Diploma Mills, 63–65. Paul Starr, The Discarded Army: Veterans after Vietnam (New York: Charterhouse, 1973), 236. “Special Message to the Congress Transmitting Report on the Training of Veterans Under the Servicemen’s Readjustment Act,” February 13, 1950, Public Papers of the Presidents, Harry S. Truman, 1945–1953. Available at the Harry S. Truman Library & Museum, The American Presidency Project, http://www.trumanlibrary.org/publicpapers/index.php?pid=656. Quoted in Teague Report, February 1952, 30. See Mark Bolton, Failing Our Veterans: The G.I. Bill and the Vietnam Generation (New York: New York University Press, 2014), 35–42, 60–103. Barbara McClure, “Veterans’ Education Assistance Programs,” Congressional Research Service, 86-537 EPW, January 31, 1986, 8. The bill prohibited GI Bill payments for new courses at for-profit schools if state agency responsible for overseeing GI Bill schools determined that the occupation for which the course was intended to provide training was crowded in the State and that existing training facilities were adequate. Bolton, Failing Our Veterans, 42. Barbara McClure, “Veterans’ Educational Assistance Programs,” 11. Ibid. Also see The Teague Report, 1. Tim O’Brien, “The Battle of the GI Bill: Sen. Hartke v. Rep. Teague,” Washington Post, July 21, 1974, C4. Educational Benefits Available for Returning Vietnam Era Veterans, Hearings on S.2161 and Related Bills, Part I, Subcommittee on Readjustment, Education, and Employment, Senate Committee on Veterans’ Affairs, 92nd Cong., 2nd Sess., March 29, 1972, 485. Bowman et al., Educational Assistance to Veterans, 177. “Many State departments of education were not adequately staffed in 1944 to perform the regular functions assigned to them by State law, not to mention the new functions assigned to them by [the G.I. Bill]. Standards for the approval of institutions and establishments varied widely in 1944 and in some States were practically nonexistent.” Veterans’ Benefits in the United States, The President’s Commission on Veterans’ Pensions, Volume III, Staff Report No. IX-B, 1956: “Readjustment Benefits: Education and Training, and Employment and Unemployment,” 19. Charles M. Chambers, “Federal Government and Accreditation,” in Understanding Accreditation: Contemporary Perspectives on Issues and Practices in Evaluating Educational Quality, ed. Kenneth E. Young, Charles M. Chambers, H. R. Kells and Associates (London: Jossey-Bass, 1983), 243–44. Terrel H. Bell, “The Federal Imprint,” External Influences on the Curriculum: New Directions for Community Colleges 64 (Winter 1988), 12. Chester E. Finn, Jr., “In Washington We Trust, Federalism and the Universities: The Balance Shifts,” Change 7, no. 10 (Winter 1975/1976): 29. The President’s Commission on Veterans’ Benefits, “Veterans’ Benefits in the United States,” April 1956, 10. Available at the Veterans Law Library, http://www.veteranslawlibrary.com/files/Commission_Reports/Bradley_Commission_Report1956.pdf. President Dwight D. Eisenhower, “Annual Budget Message to Congress: Fiscal Year 1962,” January 16, 1961, Public Papers of the Presidents, The American Presidency Project. “Veterans’ Benefits in the United States,” 296. In October 1959, Arthur Flemming, the secretary of health, education, and welfare,warned of the evils of degree mills at a press conference and charged the U.S. commissioner of education with preparing a list of degree mills for public release at a subsequent press conference The preliminary list, released by the U.S. Office of Education in April 1960, named more than thirty organizations as degree mills. See “Pollution in Higher Education: Efforts of the U.S. Office of Education in Relation to Degree Mills,” Bureau of Postsecondary Education, U.S. Department of Health, Education, and Welfare, March 1974, 3. President Dwight D. Eisenhower, “Special Message to Congress on Education,” January 27, 1958, Public Papers of the Presidents, The American Presidency Project. Robert Shireman, “The Covert For-Profit: How College Owners Escape Oversight through a Regulatory Blind Spot,” The Century Foundation, October 6, 2015, 4, https://tcf.org/content/report/covert-for-profit/. Hearings on the Reauthorization of The Higher Education Act of 1965: Program Integrity, House Committee on Education and Labor, Subcommittee on Postsecondary Education, 102nd Cong., 1st Sess., Serial No. 102-39, May 30, 1991, 427.